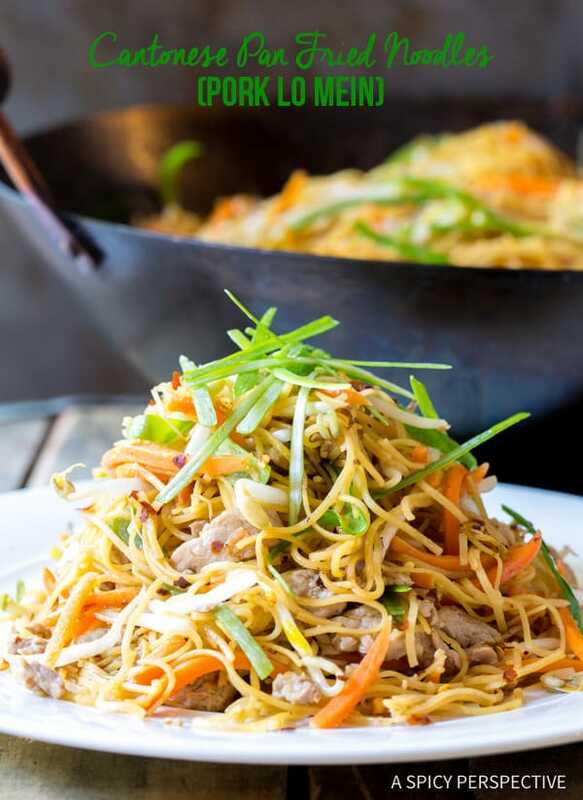 How about steaming Cantonese Pan Fried Noodles (Pork Lo Mein) for dinner tonight? Savory, spicy, and packed with flavor! We often fall into a routine of making either quick healthy dinners that cut calories, or comfort foods we know our kids won’t complain about like grilled chicken salad or spaghetti with marinara. There is absolutely nothing wrong with that. It’s good to have a few staple meals you can pull together without ever looking at a recipe. But don’t you get bored eating the same dishes over and over again? I think that’s part of the reason I initially started A Spicy Perspective. To free myself, and others, from dinnertime boredom. 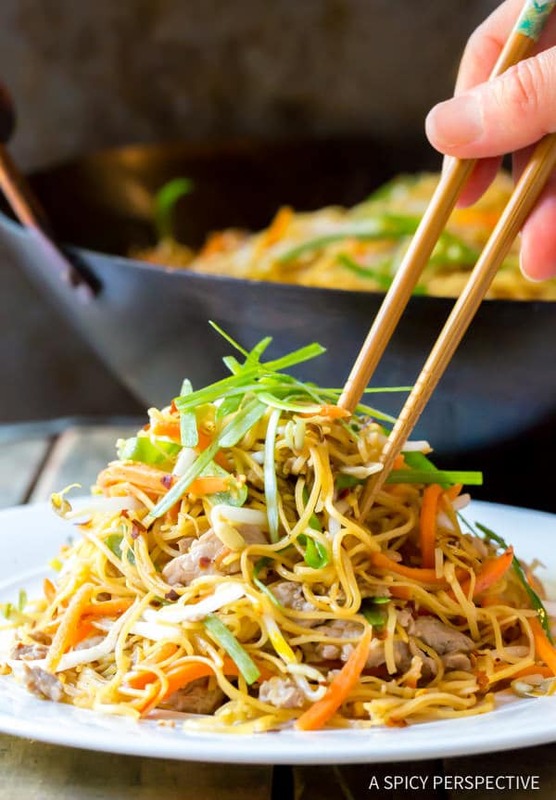 Today’s Cantonese Pan Fried Noodles recipe, AKA Pork Lo Mein, is a far cry from traditional mostly mundane dinner options. 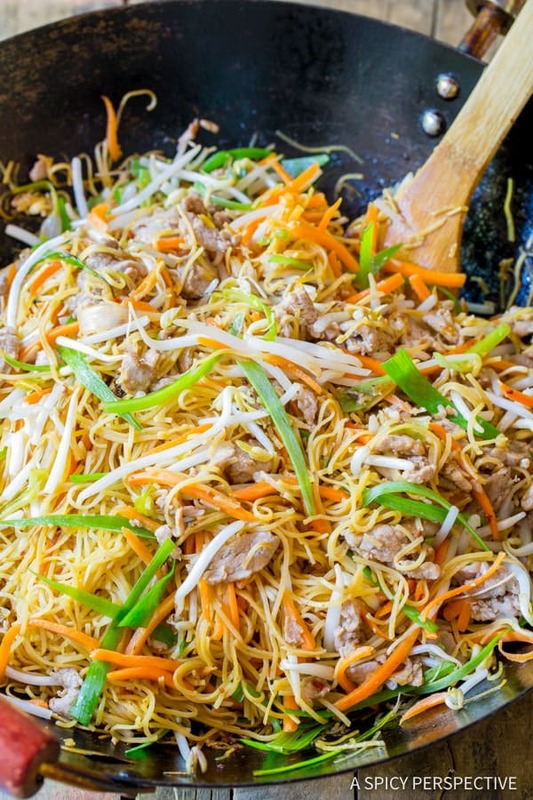 It’s packed with veggies like scallions, carrots, and mung bean sprouts, as well as stir fried pork loin, and oodles of skinny egg noodles. I generally make Cantonese Pan Fried Noodles with pork, but you can certainly swap our chicken, shrimp, or tofu. 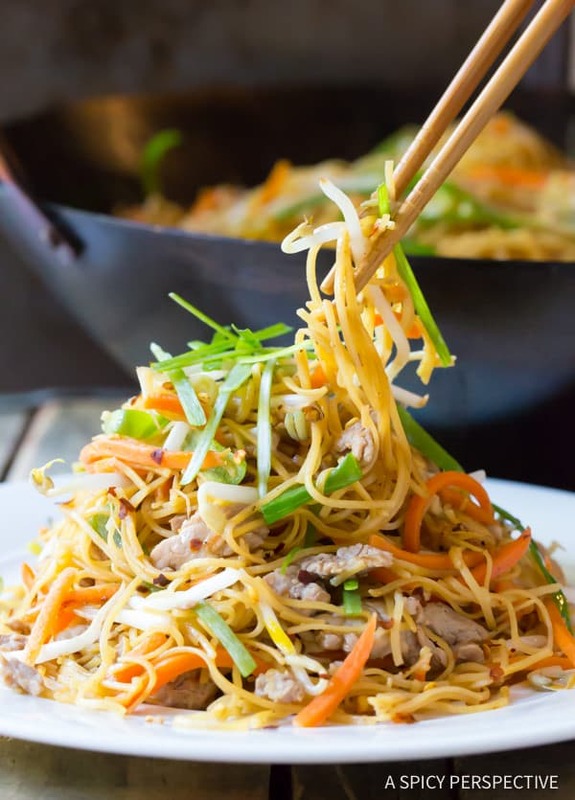 The key to making fabulous Cantonese Pan Fried Noodles, is to mix the soy sauce based dressing ahead of time, then to stir fry the pork and veggies separately so that each gets just the amount of time and attention it needs. Then toss it all back together in the end. 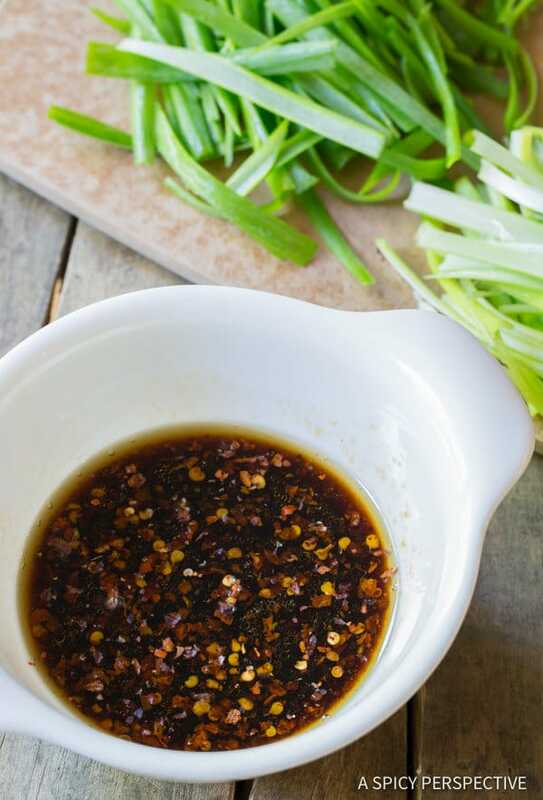 Stir fry the ingredients over a hot flame so they sizzle immediately when added to a wok or large skillet. Make sure to add the mung beans sprouts at the end, so they don’t wilt. 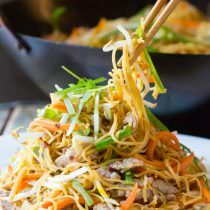 Cantonese Pan Fried Noodles is a quick meal that feeds a crowd and always, always, gets rave reviews. It will make any boring weeknight feel like an exotic celebration. 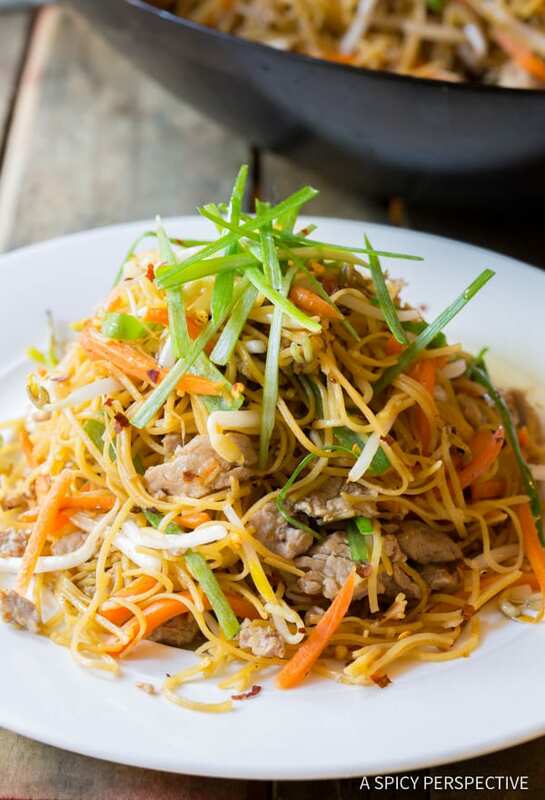 Cantonese Pan Fried Noodles (Pork Lo Mein) – Savory noodles speckled with fresh vegetables and stir fried pork. Cut the pork loin into paper-thin pieces. 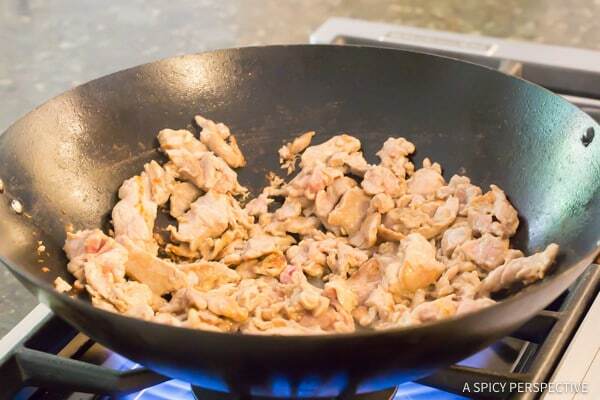 Sprinkle 1 tablespoon soy sauce and 1 tablespoon cornstarch over the pork. Toss to coat. Cut the scallions into 1 1/2 inch sections, then slice into thin strips. In a small bowl mix the remaining soy sauce with the rice wine, sesame oil, oyster sauce, minced garlic and crushed red pepper. Whisk well. Place a large pot of water over high heat and bring to a boil. Place a wok (or deep skillet) over medium-high heat. Add 1 tablespoon of coconut oil to the wok. Add the pork and stir fry for 2-3 minutes until just cooked through. Remove the pork and set aside. 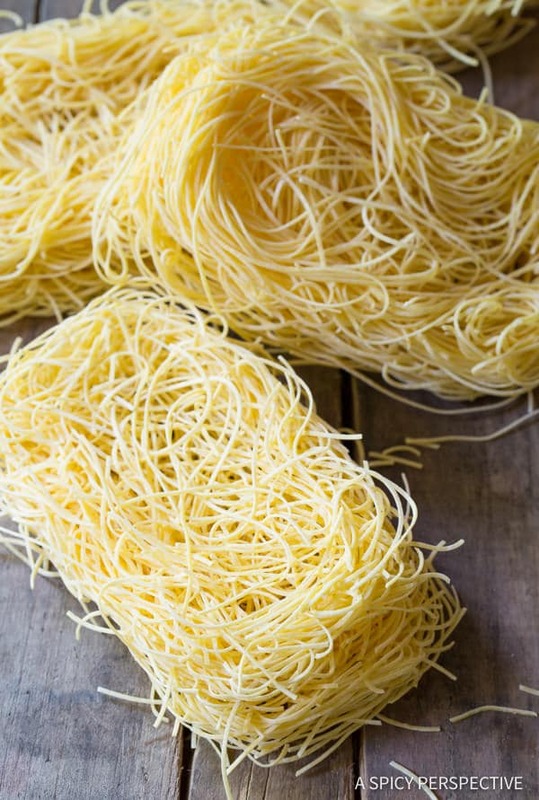 Meanwhile drop the egg noodles into the boiling water and cook according to the package instructions, usually 2-3 minutes. Drain well. Add the remaining 1 1/2 tablespoons coconut oil to the wok. Once hot, add the shredded carrots and scallions whites. 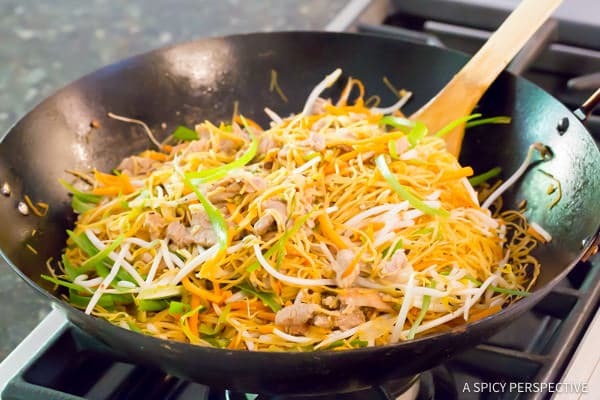 Stir fry for one minute, then add the noodles to the wok and stir fry for 2 more minutes. Add the pork and soy sauce mixture to the wok. Stir fry another 2-3 minutes. Then turn off the heat and mix in the scallions greens and mung bean sprouts. Serve warm.